To discuss your requirements moving into 2019, call Karen on 0415 142 178 or email hello@web-sta.com.au to arrange an over the phone chat. 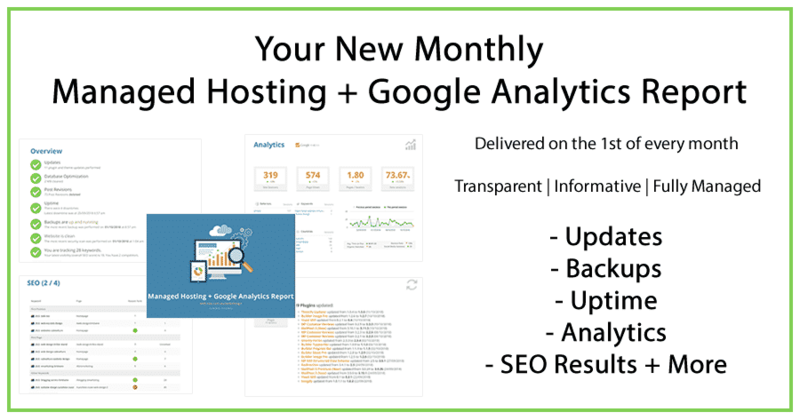 Web-Sta WordPress website hosting Clients may have already noticed, we’re now reporting on your Google Analytics and SEO Ranking Results as part of our revised monthly Managed Hosting + Google Analytics Report. This valuable component is the latest inclusion to our Managed Hosting solution, which also includes: a dedicated Web-Sta Team Member to manage your website Theme and Plugin software updates + testing. While your daily backup, performance tracking and site uptime are also monitored. We encourage you to review your next report and let us know if you have any queries. Yep, you’ve read that correctly, available immediately is the option to enjoy better cash flow when receiving Web-Sta Website Services (listed below), via our NEW monthly billing arrangement. For less than $11 per week, you can avoid the surprise of an annual Fully Managed Hosting + Secure Socket Layer (SSL) Certificate + Domain Name Renewals, especially at this time of the year - or if that’s just a better option for your business model - then monthly billing is the way to go! To bring your Services into alignment, enabling us to offer you the option of annual or monthly billing, there will be some adjustments made to invoice amounts. If you have any questions when you receive your invoice, just reach out and we’ll be happy to explain. For those wishing to pay annually, this option will still be available, at a “best price” rate. This is all great thank you Karen. We particularly like the Rich Reviews (which we approve by the way). Having this on our page and an area to direct happy clients is excellent. Google reviews can only occur if you have a google account so a lot of people aren’t using it because of that. Thank you for all of your hard work, I’ve noticed a difference in work since getting the website particularly over winter.